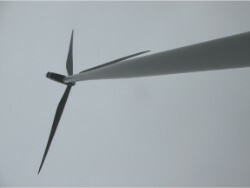 This report shows the results of the visual inspection and vibration analysis on the Ghent Tower Automotive wind turbine. 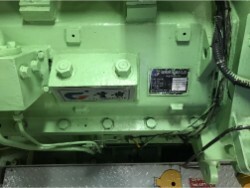 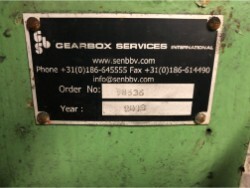 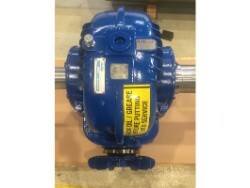 The customer has instructed GBS to visually record the condition of the gearbox. 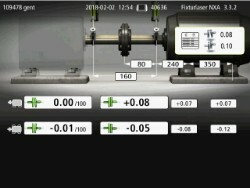 In addition, the data from the online SKF vibration monitoring system will be compared with data recorded on-site. 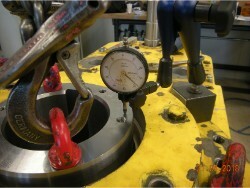 - Perform a visual inspection and oil analysis annually. 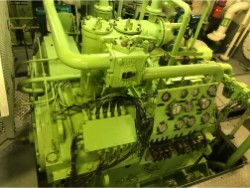 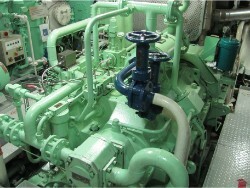 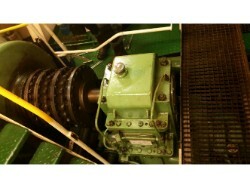 This page presents the overhaul of the propulsion gearbox� PTO shaft, on board a ship. 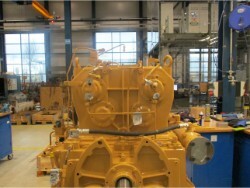 GBS was invited to perform the overhaul, following the initial inspection by GBS. 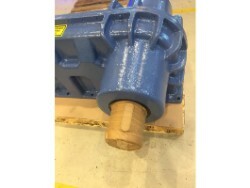 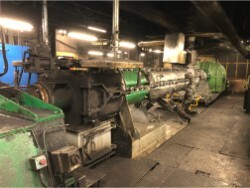 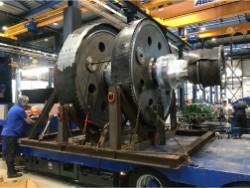 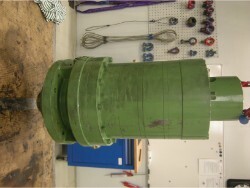 The overhaul of the PTO shaft as described in this report, was carried out successfully. 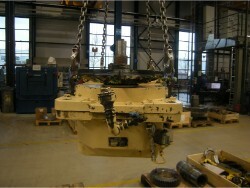 Bearings were replace and axial clearance re-adjusted. 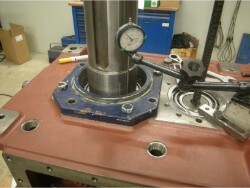 A test-run was finally carried out, showing no abnormalities in vibration, sound and temperatures. 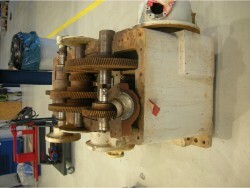 The repair of the gearbox should however be considered as a temporary solution. 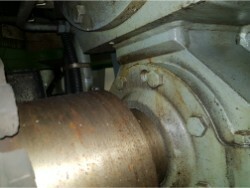 As of a consequence of the diagnosed bearing damage, both bearing pockets showed severe (old) rotation marks. 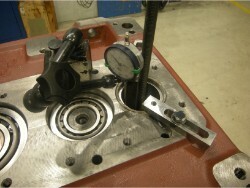 - Have the oil sample analyzed (for the determination of any wear particles). 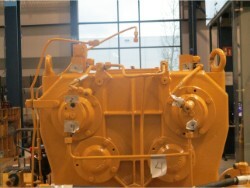 It is also advisable to check the flow at the current lubrication oil supply with the current spare gearbox. 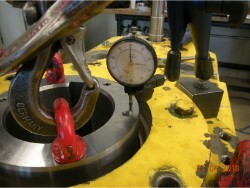 There is no further control on location, which results in the reduction of the flow. 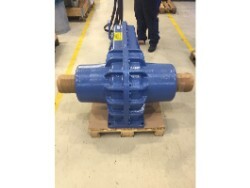 If the exact flow to this bearing is known, it must be decided whether this is sufficient for the proper functioning of the installation. 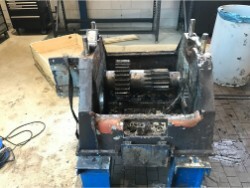 Conclusion of the overhaul from this gearbox are that the bearings were on his running hours, minor corrosion and little spots on the gears from running hours. 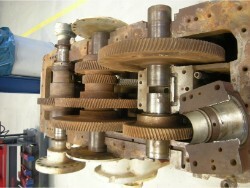 The spots and marks that you see on the gears are from still standing, because of the vibration from the ship comes in the still standing gears on each other. 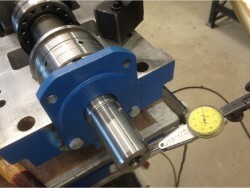 probably would input shaft bearings not make his running hours, that is because of the wrong storage of the spiroflex elements, with a wrong storage the Spiroflex isn�t balanced any more so you get vibration on your coupling, shaft and bearings. 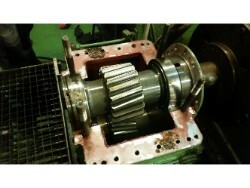 The state of the gearbox can be considered as good, only minor running marks were observed on gears and bearings. 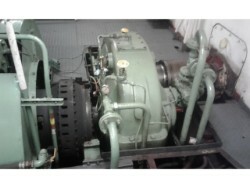 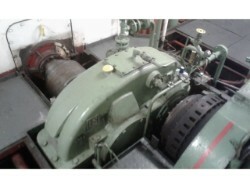 Furthermore, the gearbox externals and engine room were very clean at the time of the inspection. 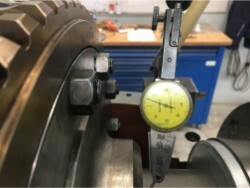 Since no drawings of the gearbox were available it was not possible to determine all bearing positions. 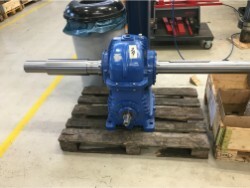 It can be expected that a combination of radial and axial bearings is present on some shafts, however these where not accessible through the bearing in front. 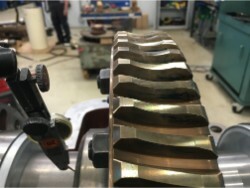 If the thrust bearing is severely damaged it could transfer damage to the next bearing on the shaft by means of indentation of debris, no such damage has been observed. 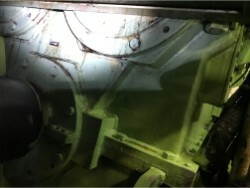 Small leakages were observed around the gearbox oil pipes and covers. 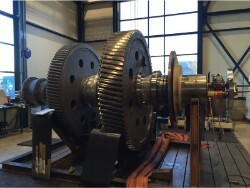 Micro pitting is observed on the working flank of the pinion gear of the intermediate shaft ahead and working flank on the output shaft gearwheel of the output shaft. 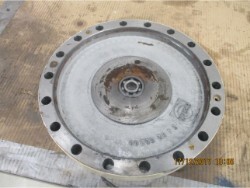 Small steel particles were observed in the filter elements. 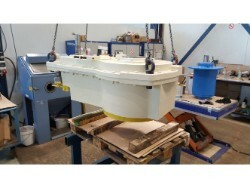 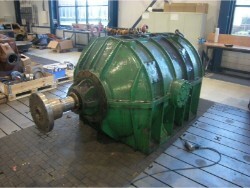 This page provides an overview of the inspection a ZOLLERN planetary winch gearbox. 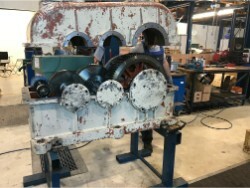 The gearbox was sent to the GBS International workshop to carry out the inspection. 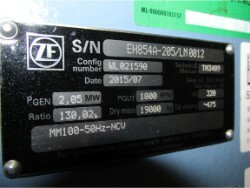 All findings are listed here. 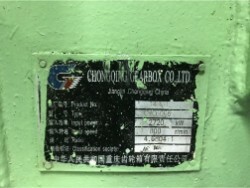 The working parts of the gearbox are in good condition, gears and shafts can be re-used, as well as the planetary gear bearings. 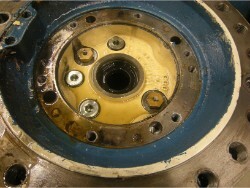 Other bearings should be replaced. 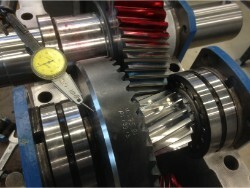 Bearing pos. 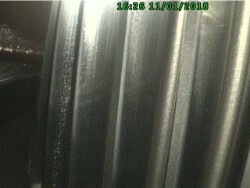 1 of the input shaft, shows a gray dull appearance. 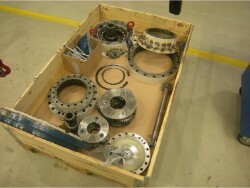 No further damages were observed. 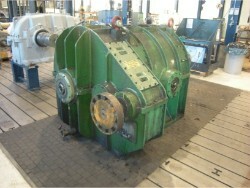 However no information about the running hours of the gearbox were available. 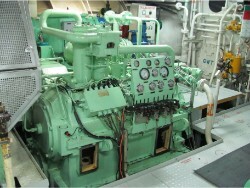 The main engine running hours are exceeding the recommended gearbox running hours. 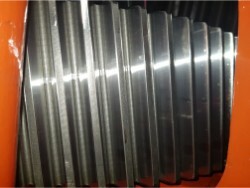 Small steel particles were observed in the filter elements, most of these particles were brass material. 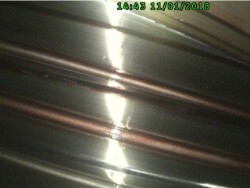 This can be caused by wear on the clutch plates, or from the bearings with brass cages. 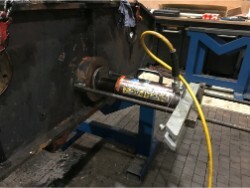 The output shaft (assembly) was overhauled in the GBS International workshop, prior to sustaining damage during transport to the vessel. 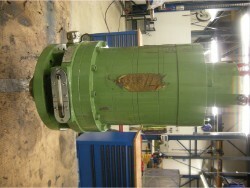 Upon discovering the damage, the client returned the shaft to GBS, to assess and repair the damage. 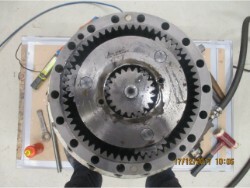 Micro pitting is found on the working flank of the pinion gear of the intermediate shaft AHEAD and working flank of the Bull gear of the output shaft.